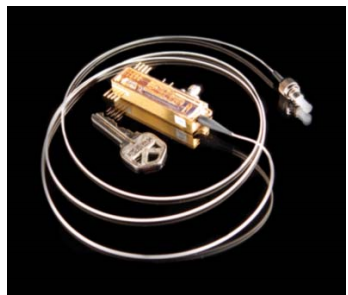 A quantum internet capable of sending perfectly secure messages has been running at Los Alamos National Labs for the last two and a half years, MIT Technology Review reports. One of the dreams for security experts is the creation of a quantum internet using quantum cryptography that allows perfectly secure communication based on the powerful laws of quantum mechanics. The researchers created a quantum network based around a hub and spoke-type network. All messages get routed from any point in the network to another via this central hub. The problem with this approach has been scalability. The researchers say they’ve solved this by equipping each node in the network with quantum transmitters (lasers), but not with photon detectors, which are expensive and bulky. Only the hub is capable of receiving a quantum message (although all nodes can send and receiving conventional messages in the normal way). The big advantage of this system is that it makes the technology required at each node extremely simple — essentially little more than a laser. Their ultimate goal is to have one of these modules built in to almost any device connected to a fiber-optic network.